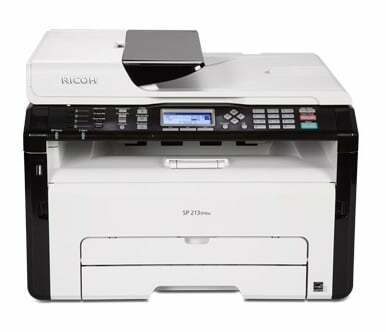 A mono laser printer, the Ricoh SP213SFNw is multifunctional and can copy and print as well as scan. There is also a paperless fax feature, which is useful. Ideal for the small or home office, the SP 213SFNw comes with Wi-Fi and document feeder. It prints and copies in black and white but can scan in colour. It is a basic all-in-one mono printer but is capable of producing text prints of a high quality. However, there may be difficulties setting up this printer on a network. The Ricoh SP213SFNw weighs in at mere 9.9kg and its dimensions are 402mm x 360mm x 252mm, so it does not take up a lot of space. It comes with a document feeder on top to make the SP 213SFNw ideal for both scanning and copying multiple page documents. Warm-up time is only 25 seconds, first output speed 10 seconds and the continuous output speed is 22 pages per minute. For copying there is a multiple copying capability for up to 99 copies and a zoom facility of 25% to 400% in 1% steps. The Ricoh SP-213SFNw can help save on overall costs, as printing with it is inexpensive. It has been shown to be one of the cheapest mono laser printers to run. An all-in-one cartridge with high yield capacity produces up to 2,600 prints and the regular yield, 1,500. Text print with this model is of an exceptionally high level. Also saving on the cost of paper is the SP 213SFNw manual double-sided printing feature, while ID Card Copy, which allows both sides of card to be copied on the same sheet of paper, also adds to this machine’s cost efficiency. Some users have complained of difficulties when setting up the printer on a network. The Ricoh SP 213SFNw also cannot be used to print directly from a smartphone and has no cloud print facility.